"" Writer's Wanderings: Nothing in Life is Free. . .Except. . . Nothing in life is free is a mantra of my husband's making that my kids grew up hearing and learning. There are however some things that are "free" as you travel that you may or may not be aware of. 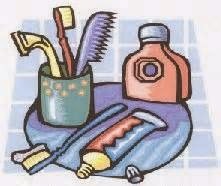 For instance most hotels and bed and breakfasts provide soap, shampoo/conditioner and often lotion in your bathroom. What you may not know about is what is at the hotel desk that you could use if you needed to. I remember getting stuck in Houston because of weather on a trip from San Antonio to home. Our luggage was taken off the plane and placed in a room under lock and key. We could even see it through large glass windows but could not get our hands on it to get anything we might need for our overnight stay. The hotel that the airline put us up in when all flights were canceled offered us an overnight kit of toothpaste, a toothbrush, a comb, a razor, a little packet of shaving cream, wipe on deodorant, and a mint. We laughed over it but it served the purpose nicely--even the mint. Most hotels have extra things at the desk for those travelers who packed in a hurry or just somehow forgot some of the basics toiletries they would need. Before you go out to try to find the nearest store, ask at the desk. There's no charge for a toothbrush and a little tube of paste among other items. Foreign hotels often have converters on hand if you need to plug in and forgot yours. Many hotels now have chargers available if you left your phone charger plugged in at home and forgot to grab it. As I was reading some articles about what hotels do offer, I found that there is one chain called the Kimton that has a yoga mat in every room and you can even ask for curling irons or flat irons for your hair. They also have contact lens solution for a nominal fee. Now there's been times I could have used that. Hyatt has also begun a program called Hyatt Has It which provides quite a list of freebies as well as items with a small charge attached. The bottom line is, always go to the desk if you've forgotten to pack an essential (even socks). Ask politely if they know where you could get said item and you will be amazed at what they may have on hand--for free!. At the very least you'll be given directions to the nearest supplier of said item. My mantra? It never hurts to ask.